I recently read a tirade by yet another person complaining that conservationists and environmentalists prefer animals to human beings. I find this endlessly frustrating because what made me love birds in the first place was my connection to beloved people who loved birds. My grandmother died when I was very little. My only personal recollection of her is climbing into the bed with her after her double radical mastectomy. She couldn’t lift her arms to hug me, and asked me to lift them for her. Her warm touch infused me with love. She was named Laura too, and my aunts and uncles told me throughout my childhood how much she loved birds. After she died, whenever I saw a bird winging through the sky, I felt a warm glow as if it were a messenger from heaven, carrying my love to my grandmother, and her love back to me. My Grandpa told me that when he was a young man, he read a newspaper story about the death of the last Passenger Pigeon. He said extinction was the saddest thing on earth, marking the end of one of God’s creatures forever and ever. Now when I think of the story of Noah’s Ark, I remember my Grandpa. The God of the Bible, who took notice of the fall of a sparrow, was quite specific in his command to Noah to to save every species. Strands of love for my Grandpa are especially woven into my love for warblers. He had pet canaries, and told me stories about miners who brought canaries down into the mines. If a canary died, the men knew they had to get out in a hurry before undetectable poisonous gases killed them. The first time I saw a flock of warblers, as tiny as canaries but bearing glowingly vivid plumage, I thought they must be the angels of those canaries who had died to save human beings. Long after I discovered what warblers really were, seeing them in brilliant spring plumage still makes me feel as happy and safe and warm as that little girl snuggled in her grandpa’s lap imagining angel birds. My grandmother died before I turned 2, and we saw my Grandpa only once or twice a year. My home was dysfunctional, chaotic, and violent, and many children in our neighborhood weren’t allowed to play with us. But at bedtime, I’d listen to House Sparrows cheeping excitedly from bushes along the house. They seemed to be telling one another stories about their day’s adventures as they said goodnight. No one ever kissed me goodnight or tucked me in, but I imagined belonging to a sparrow family—that made me feel less lonely and excluded. On the first day of first grade, a sweet young priest named Father Ciemega came into our classroom. When he asked if anyone could recite the alphabet, I lurched up, waving my hand in a most Hermione Granger-like way. 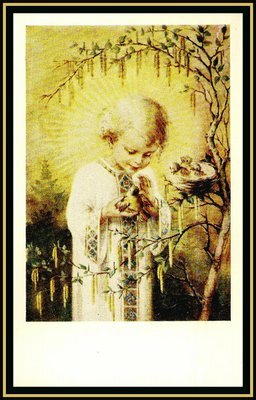 He called on me, and after I reached ‘xyz’, he handed me a holy card depicting God’s hand gently cradling some baby sparrows. That seemed like a special message just for me. I can’t speak for all environmentalists, but my love for birds is fundamentally rooted in these deeply personal, human experiences. Close encounters of the bird kind don’t just gratify the human mind—our experiences with birds have the power to touch our hearts and stir our very souls. In coming weeks, I’ll focus some blog posts and "For the Birds" programs on deeply spiritual, soul-enriching experiences I’ve had with special birds. These are some of the features I've used for past April Fools Day and National Blue Jay Awareness Month programs on For the Birds (programs dating from 1986). Most of these songs were previously available as a CD on Cafe Press called "For the Boids," but I wasn't getting any money for them anyway, so you can download them for free here. Some are funnier than others, but some people have loved every one of these. Copyright info and people who are featured are listed and easily accessible if you listen in iTunes. Several people have said that "Where the Boids Are" is the best thing I ever did. One of the greatest difficulties in being an environmentalist is trying to see both sides of an issue. Take energy conservation. During the 1973 oil crisis, when a consortium of countries,mostly in the Middle East, tightened controls on the world’s oil supply, Americans panicked, initiating more oil exploration in Alaska, Canada, the Gulf of Mexico, and the North Sea. Environmentalists warned about the potential for disasters such as what happened with the grounding of the Exxon-Valdez and the BP oil spill, but those fears were pooh-poohed away by people legitimately concerned about the critical ways our energy supplies figure into national security, and by people only concerned about capitalizing on oil company profits. I took this photo of a badly oiled night heron at Barataria Bay after the BP oil spill. The spill was far, far worse on wildlife than was reported. The national security issue goes both ways, of course. Depending on any foreign powers for fundamental needs in the US is foolish, whether they be energy resources or critical computer components and consumer goods, but the very people who talk the loudest about us needing to be energy independent for national security are among the ones who outsource more and more critical manufacturing to China. And meanwhile, those environmentalists who have been talking about energy conservation since the 60s and 70s, because of the critical roles fossil fuels play in air and water pollution and climate change, are ever shouted down. We had the technology to make cars much more efficient, and during the Nixon administration set fairly strict standards for mileage of auto fleets which would have made a much bigger impact except that then Congress exempted minivans and SUVs from being considered passenger vehicles to dilute the effects of those standards. It’s been heartbreakingly frustrating watching scientists paid for by the Koch Brothers conduct studies to prove that global warming is non-existent as more and more glaciers melted, average annual temperatures over the planet climbed, and insurance costs for weather-related claims mushroomed. Once it finally became impossible for climate-change deniers with a Ph.D. after their name to keep any kind of credibility with the scientific community, one by one they finally started conceding that yes, climate change is indeed happening, but really, how could it possibly be caused by one measly species? Now more and more of these paid deniers are finally being forced to admit that their studies were flawed, or at least they’re accepting that “new data” has made them reevaluate their findings and, yes, climate change does indeed exist and is indeed caused by our activities. If this has all been a frustrating nightmare for environmentalists, it’s been heartbreaking to watch as one by one the national treasures we’ve managed to protect or restore for ourselves and wildlife are sold off to the highest bidders. Ever since the 1930s, companies have been drilling and operating oil wells on the Aransas National Wildlife Refuge, which serves as the winter home for every single member of the truly wild flock of Whooping Cranes that breed in Canada. Only a few of these oil wells are still producing, and most of the recent wells drilled there have not been economical to operate, yet Hillcorp Energy Company is requesting a new permit to drill there. The way the laws are written, National Wildlife Refuges aren’t designated wilderness areas and multiple use mandates require that companies be allowed to explore and extract minerals and fossil fuels, though special use permits can limit where and how their work is done. There is a very limited period for public comment—letters will be accepted by the US Department of the Interior through August 17. We can’t stop the drilling, but we can ask that all exploration be limited to areas away from where the cranes are, and we can also exert a bit of pressure on the publicly-held Hillcorp Energy Company to make them aware that people are watching them. U.S. Dept. of Interior Press Release about the Project and Making a Public Comment. Yesterday I announced that this is National Blue Jay Awareness Month, and immediately got an email complaining that I wasn’t making it National Steller’s Jay Awareness Month. My program has a fundamental bias toward Eastern species because I’ve only lived in the East. I’ve seen thousands of times more Blue Jays than Steller’s Jays, and I prefer talking about things I know about. But a lot of people do listen to my radio show via podcast or look at my blog, which has the scripts, and I have indeed seen my share of Steller’s Jays, so today we make a poor attempt to give equal time to a Western bird. The first thing I noticed about Steller’s Jay, long before I ever saw one, was how “Steller” was spelled, in my field guide. The bird is quite handsome—darker than a blue jay, some populations with deep blue crests, others with blackish brown, but all with virtually no white in their plumage. 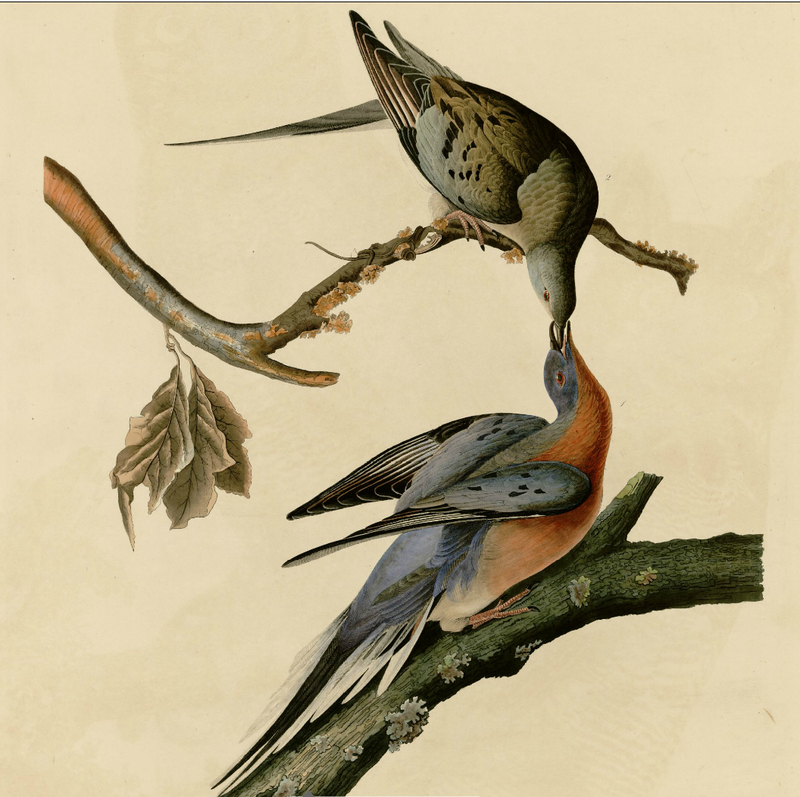 They’re certainly striking birds, worthy of the appellation “stellar,” but the name comes from Georg Steller, the ship naturalist on a Russian explorer’s ship in 1741, who collected and described many of the animals he encountered on an Alaskan island. He knew the expedition had reached America because the dark crested jay he saw was so similar to a picture of the Blue Jay he’d seen in Mark Catesby’s 1731 book The Natural History of Carolina, and it was nothing like any of the birds of the boreal forests of Siberia. Steller collected a specimen—a scientific way of saying he shot and stuffed one—but it was lost when the expedition was marooned on Bering Island. His field notes survived, and were detailed enough that the German naturalist Johann Friedrich Gmelin officially described the species using his notes. Steller’s sea lion and Steller’s Sea-Eagle are also named for Georg Steller, which is spelled s-t-e-l-l-e-r. Both of North America’s only crested jays are noisy birds and excellent mimics, and are the only New World jays that use any mud in their nest construction. Steller’s Jay is tightly associated with coniferous forests, and far more focused on people than the Blue Jay. My first experiences with it happened within minutes of arriving at campgrounds in the West when my sister-in-law and I took a trip in 1979. Two other corvids, the Gray Jay and Clark’s Nutcracker, came in almost instantly and were alighting on my hands within minutes when I offered peanuts. The jays were more standoffish, but they readily swooped in and grabbed anything I tossed out. We stayed at the campground in Yellowstone for three nights, which was long enough to get one Steller’s Jay to finally alight on my hand for food. Now feeding birds in national park campgrounds is no longer permitted, so Steller’s Jays don't consider us an easy source of food anymore. When Russ and I were in the Grand Canyon last fall, the Steller’s Jays we encountered didn’t pay the least bit of attention to us. The West is, overall, a harsher and drier environment than the East, and many birds are more opportunistic than related Eastern species. In this case, Steller’s Jays are far more predatory than Blue Jays. Almost 90 percent of an adult Blue Jay’s diet is vegetal, and most of the animal matter is insect, but Steller’s Jays take more meat not just to feed their young but to eat outright themselves—they even kill and eat small adult birds such as juncos and nuthatches. Although they can be just as loud as Blue Jays, they aren’t in the habit of squawking at every little thing, because when they do spot danger, they often hope to capitalize on it themselves. And their dark plumage helps them hide within the shadows of the forest. It takes a bit more work to notice them, and I’ve yet to take a decent photo of one, but this handsome, spunky jay is quite worth searching out.